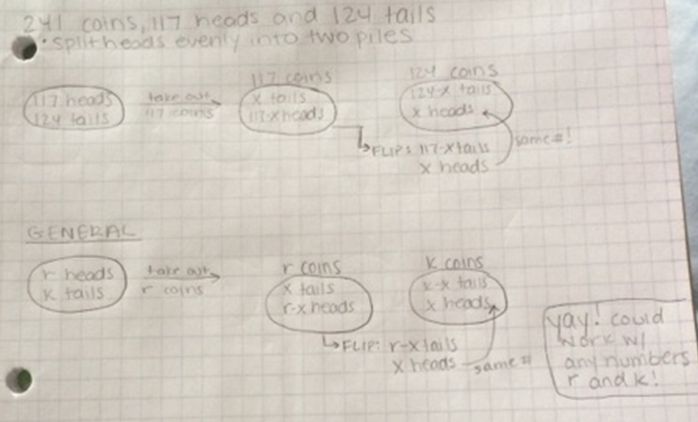 Editor's Note: Cecilia M. ('16) investigates a puzzling problem involving coins. Problem: You are given 241 coins that consist of 117 heads and 124 tails. You are blindfolded and need to find a way to split the heads evenly into two piles. Solution: After a lot of trial and error, I discovered that you first must separate the coins into two piles where one consists of the number of heads you have (117 coins) and the other has the number of tails (124 coins). Next, flip each coin in the pile that contains the number of head coins that you originally had (the pile of 117 coins). The number of heads in this pile should now equal the number of heads that are present in the pile of 124 coins, the goal of the problem. This method should work for any number of coins, as shown in my work below.